Every developed country except Canada knows that safe, affordable housing is a critical key to social, physical and emotional well-being. The list of poor outcomes associated with poor and unaffordable housing is long, and gets longer with every study. Higher rates of poor health, especially connected to respiratory illnesses and stress-related illnesses, poor school attainment, higher rates of family violence all are directly related to poor housing. Unaffordable housing forces individuals and families to choose between food and shelter, not filling medical prescriptions, not being able to participate in normal community activities such as children’s sports. Canada’s current government alone seems oblivious to the economic and social costs of not having a real housing policy. This election we expect all political parties to put housing at the top of their agenda and the make the right to housing accessible to all Canadians. A strong housing policy has three overlapping, but clearly separate components. Market housing, either in a house or an apartment, meets the need for those who can afford housing. 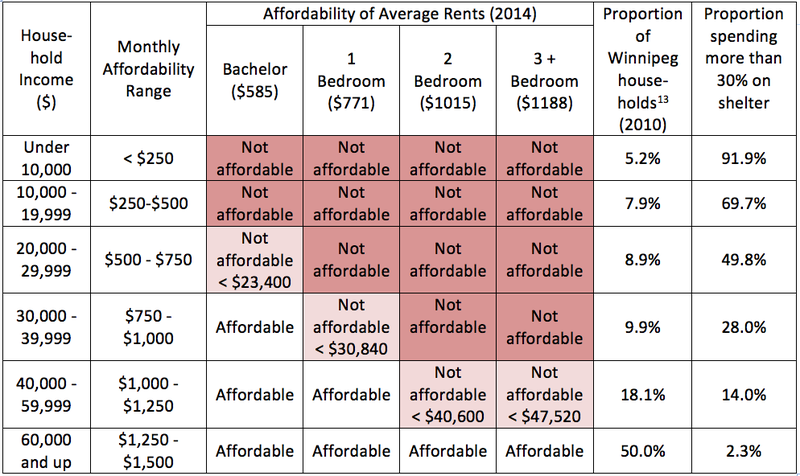 Affordable housing has a level of public subsidy, but meets the needs of lower income singles and families. It is often sponsored and supported by community groups, or takes the form of a Co-op, where some tenants pay market rent, while other receive varying levels of subsidy, usually based on income. Public, rent-geared to income (RGI) housing, provides for those who cannot afford any level of market housing. Until the end of 1993, Canada did pretty well balancing these three legs of housing provision. We even won a United Nations commendation for our housing policies. However, on December 31, 1993, the federal government ended all new social housing programs. No more Co-ops or public RGI housing, and no federal support for any affordable housing. Like a slow-moving train-wreck, our housing sector got more and more out of balance, as real shortages of affordable rental housing developed across the country. This growing imbalance in the rental market was made much worse by changes in the federal tax code which had a very costly impact on rental housing construction. By the end of the 1990s, only 5,000 rental units were built in the whole nation. Housing for our lowest income citizens was aging, and some units were lost. Making matters worse, thousands of apartment complexes were converted to condos, which were much more lucrative for builders. Older apartments fell off the market, because rents were too low to maintain the buildings, and age was taking its toll. In Winnipeg, we welcomed over 100,000 new citizens between 1992 and 2014, but had a net loss of 5,200 apartment units. Fewer units on the market meant higher rents, which escalated above the rate of inflation. The loss of affordable market rental units, coupled with the increased costs of new rental construction meant that more and more families sought public RGI housing, or suffered the consequences of not having money for both food and rent. Food banks proliferated and continue to grow. While Canada and Manitoba tried to keep welcoming refugees, finding housing for newcomers became virtually impossible. Arriving First Nations people faced the same dilemma. They came to Winnipeg seeking a good life for their families, but often foundered in the face of poor and unaffordable housing. It’s time to begin to repair the damage, and the money is there to do so. Canada Mortgage and Housing Corporation used to break even at best. But over the past eight years, is has become ever more profitable. In 2014, profits were over $3.5 billion, all of which went straight to the federal government’s bottom line. In fact CMHC has bragged that it has “contributed over $18 billion to improve the government’s fiscal position.” In spite of these record-breaking profits, research support for housing was cut by 50% in 2013. We increasingly lack good data for housing planning. • Take at least the majority of CMHC profits and re-invest them in new RGI and affordable housing, in partnership with provinces, territories, First Nations, cities and non-profit housing groups. • Maintain support for existing social housing projects that are rapidly losing their ability to keep rents low as their subsidy agreements expire. • Review and amend the federal tax provisions that inappropriately burden rental housing construction, allowing new, affordable rental units to once again meet the housing needs of many modest income families and singles. • Renew and support research and data collection showing housing need and affordability across Canada so that provinces, territories, cities and non-profit groups can plan for the future with good data that is freely available. This election, ask your candidates what they will do to make affordable, safe housing available to all our citizens, not only those who can buy a house or condo. Tim Sale is a CCPA­ Manitoba research associate, former provincial minister of housing, and chair of the federal working group for the Right to Housing coalition.